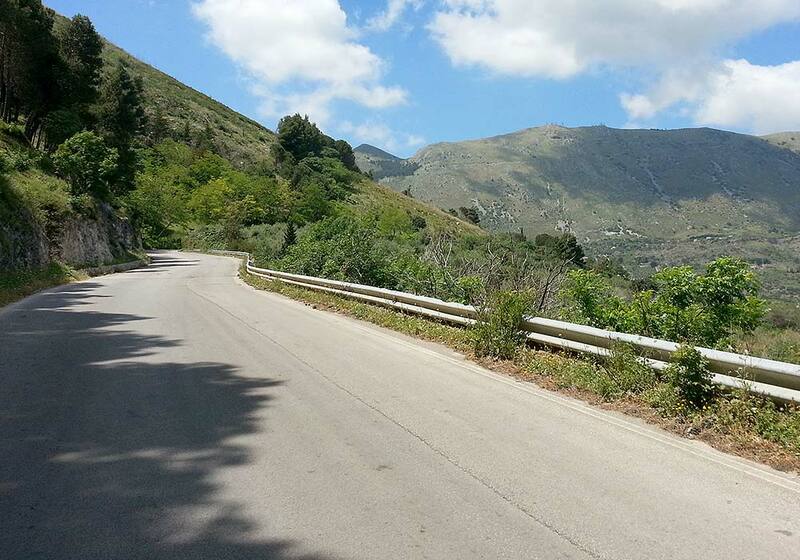 A long and intensive bike route to San Cipirello, through the Sicilian towns of Carini, Montelepre and Ponte di Sagana. With 1365 meters of ascent, this is a bike ride for real mountain goats! When you’re near Montelepre, turn left in the direction of this town (SP1) and then follow the SP1 in the direction of Bellocampo. After having passed the cemetery, turn right in the direction of Monreale and Sagana. Follow this road until you reach the SS186. Turn left here in the direction of Palermo, Monreale and Pioppo. Turn right at the bar “La Maison du Cafè” (SP20) in the direction of Palermo, Giacalone and San Giuseppe Jato. Follow the SP20 until you’ve reached San Giuseppe Jato. The Via Palermo will lead you into town. Follow the Via Palermo until you’ve reached a fork in the road. Turn right here in the direction of Camporeale and Corleone (Via Vittorio Emanuele III). Turn left at the blue sign for “Piana degli Albanesi” (Via Nuova) and turn right on the Via Umberto I. When you’ve reached the one way street Via Roma, turn right in the direction of Partinico, Camporeale and Corleone (Via del Bosco). Turn right on the Via San Filippo and then follow for Partinico, Camporeale and Corleone (Via Enna – Via Giacomo Matteotti – Via Mazzini). Turn right at the end of the Via Mazzini in the direction of Partinico (SP2). Follow this road (you’ll pass Lago Poma) until you’ve reached the town of Partinico. When in Partinico, go underneath the SS186 and immediately turn right in the direction of Palermo and Trapani. This will lead you to the roundabout, where you need to go left in the direction of Balestrate (SS113). Follow this road and turn right at the exit for Balestrate. Follow this road, the SP17, until you see the Eni gas station on your right. Until the town of Montelepre, this bike route is the same as bike routes L5 and L6. Until Ponte di Sagana it is the same as bike route L6. L5 is the shortest and L7 the longest of these three bike routes.